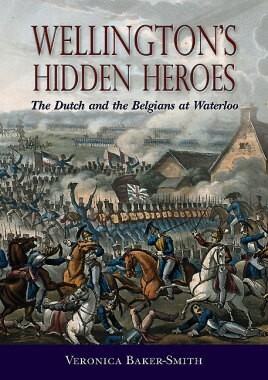 A highly original account of the previously unacknowledged crucial role that the Netherland forces played in averting defeat at the Battle of Waterloo and other battles in the Waterloo Campaign. "Sixteen pages reproducing paintings in full color illustrate this fresh assessment that adds another dimension to the Waterloo campaign of 200 years ago. A reader is left thinking that Wellington failed to adequately acknowledge the debt he owned to the Netherlanders. But the field marshal also once said “there should be glory enough for all,” something his Dutch-Belgian allies are accorded in this book." An extraordinary and impressively researched, written, organized and presented history that sheds considerable new light on one of the most influential battles of 19th Century Europe, "Wellington's Hidden Heroes: The Dutch and the Belgians at Waterloo" is very highly recommended for the personal reading lists of members of academia and the non-specialist general reader with an interest in Wellington, Napoleon, and their consequential conflict at Waterloo, as well as a core addition to community and academic library 19th Century European History collections in general, and 'The Battle of Waterloo' supplemental studies reading lists in particular. "Waterloo is widely seen as a victory for Great Britain over France, and without doubt English courage abounded on that harrowing day. Proper credit is also due to the Dutch and Belgium troops who made up a full third of the Allied army at the battle. These troops are often given only passing mention at best, described as second rate soldiers who contributed little if anything to the outcome; however they are increasingly receiving the acknowledgment they more properly deserve, as argued in this new book. The author maintains that these troops commanded by the Prince of Orange, averted disaster for the Allied army at Quatre Bras and at Waterloo thus allowing the British time to recover from setbacks. The author combines extensive research from the Dutch archives with a clear writing style to make this work a fascinating read." "By perusing Belgian and Dutch archives, memoirs, and histories, she has put together an impressive study of the role of the largely overlooked – not to say dismissed and even denigrated – Dutch-Belgian troops who made up about a third of Wellington’s army during the campaign. She makes an excellent case that these troops, and the often belittled Prince of Orange who commanded them, made a solid contribution to the Allied victory, on several occasions playing a critical role....a valuable addition to the literature on Waterloo"
"The author is careful to give credit where it is due. She praises Wellington's skillful command of coalition armies, his appreciation of the Prince of Orange's value as a subordinate and ally, and his humane concern to protect his soldiers from the nitpicking accountants in London. She succeeds in capturing the perspective of both the Allied forces (British, Dutch, and Prussian) and the French. That is, she has not simply produced a hatchet job on the Duke of Wellington, something too common in revisionist histories in general....Not only general readers but specialists in the subject will find much to appreciate in Wellington's Hidden Heroes, with its salutary stress on the unsung courage of Dutch and Belgian soldiers who disobeyed Wellington's orders at both Quatre Bras and Waterloo in order to save his position against heavy French assault."